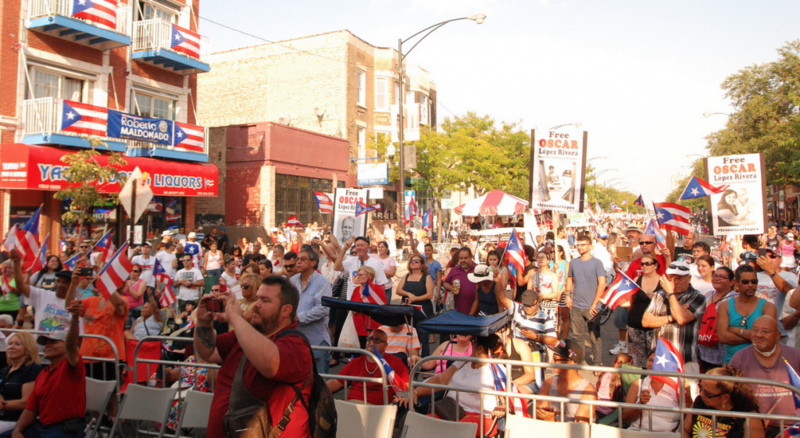 The 22nd Fiesta Boricua de Bandera a Bandera was another huge success. This year , many of its traditional aspects such as the celebration of the “Mejor de Nuestro Pueblos” represented by Cayey, lo “Mejor de Nuestro Barrio” represented by Orlando, FL. Misa Jíbara officiated by Father Raul, and musically accompanied by Grupo Aroma. In terms of lo “Mejor de Nuestros Barrios”, several activists Jimmy Torres Vélez, organizer Marcos Vilar and community activist Zoraida Andino Rios, and the legendary salsero Domingo Quiñones, traveled from Orlando to highlight the Saturday closing musical event. Cayey was represented by Mayor Rolando Ortiz Velázquez, who headed a delegation of nearly 200 cayeyanos, and learned that Mayor Rahm Emanuel, through a proclamation, designated Sept 5 & 6 as Cayey Days in Chicago. Cayey also treated Chicago’s Puerto Rican community with the music of Alambre Dulce. Sunday’s closing musical act, was headlined by Orquesta Macabeo, interpreting the latest musical expressions of the millennial generation of Puerto Rico. * A magnificent, colorful jamboree parade with the Banda Municipal de Cayey and the cabezudos of Pedro Adorno, representing the figures of Roberto Clemente, Julia de Burgos, Segundo Ruiz Belvis and Oscar López Rivera. An aesthetically pleasing mural by Christian Roldan welcomed the Cayeyanos with an image of Cayey’s native son, the artist Ramon Frade. The above additional activities made the 22nd Fiesta Boricua another amazing achievement in the altitude of cultural expressions in our community, but it would not have been the same without the delicious food, the improvised dancing, the multiple expressions of creations of the country’s artisans, and the bombazo at La Casita de Don Pedro. It was a celebration of our community’s life and creativity as well as a cultural immersion for the many non-Puerto Ricans who enjoyed the weekend on Paseo Boricua.